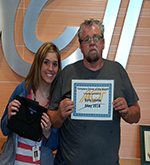 Gary Luoma was the May Company Driver of the month. Gary lives in Kansas City, MO and his safety advice is to watch out for everyone. Gary has collectively been at ACT for 8 years. Jessica Dye is his DSM. Gary appreciates how Jessica is always positive and he enjoys the traveling that driving a truck allows.